Sponsor: Museum of Modern Art, Chicago Il. Many years after the Chicago Tribune’s 1922 architectural competition for new headquarters, the distinguished curatorial group – Stanley Tigerman, Stuart Cohen and Rhona Hoffman – invited architects to submit contemporary projects, called “late entries,” to the original competition, irrespective of the original organizers selection, from 260 international entrants, for a Gothic revival skyscraper by the architects John Mead Howells and Raymond Hood that stands today at Michigan Avenue. 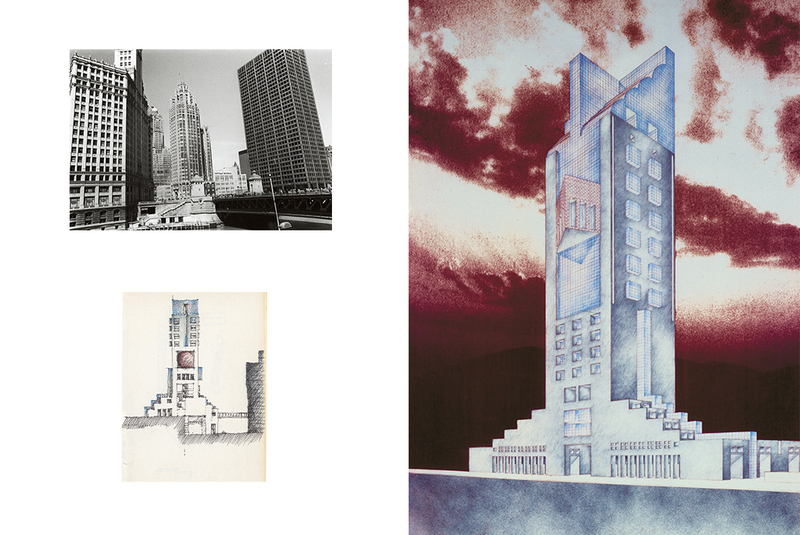 “Chicago Tribune Tower, Late Entries” namesake exhibition and catalogue documents a dynamic period in American architecture, and George Ranalli Architect presents a concept design for a multi-use, high-rise tower offering distinctive commercial space and spectacular skyline views, a theater and ground floor ‘main-street’ retail pavilion, and a media production center. 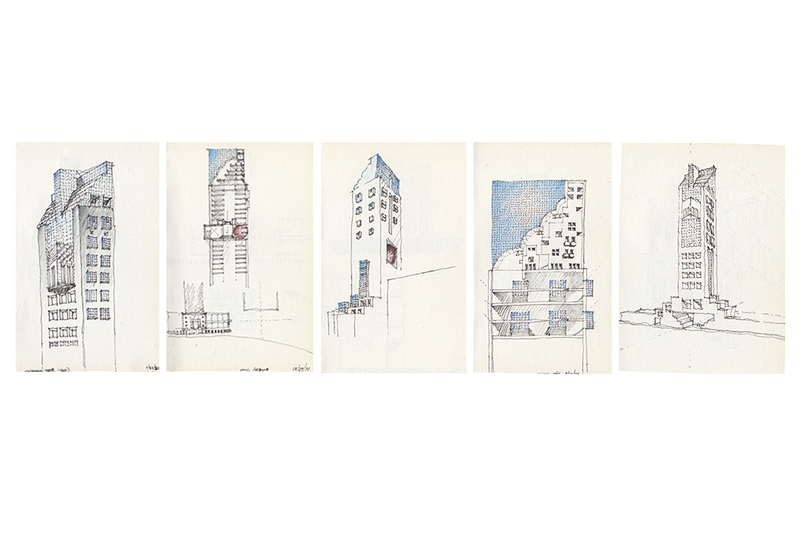 As the architecture moves skyward, its materiality dissolves in a stepwise progression. A broad masonry base gradually transforms into a prow-like glass elevation, and beyond, glass vaults. Midway, the structure accommodates program in a 90-degree rotation of orientation. At the top, habitable space is filled with natural sunlight beneath cascading glass. Office space distributed throughout the tower adjoins a cube-shaped, and a sphere-shaped space, protruding at the front and back, for a theatre and media production respectivly. The submission of George Ranalli Architect to Chicago Tribune Tower, Late Entries is mixed media. A hand drawing onto a photo-collage was converted to a sepia print, which was then hand rendered in graphite and color pencils, shades of blue chalk, and a gray wash was applied to the tower base and select smaller areas. Read More: Design: ’80 Show Evokes Chicago, ’22 by Paul Goldberger, The New York Times, June 05, 1980.